They may not have a little bow on them, but man, they have attitude! Next time someone tells you it is better to cycle in lycra, remember this picture. I rode 19 miles today, in San Francisco traffic, I rode from City College to the Mission, back to CCSF and out to the beach. From there I picked up my 40lb son, 5 lbs of potting soil and a tomato plant and rode the 8 miles home, up hill the whole way. 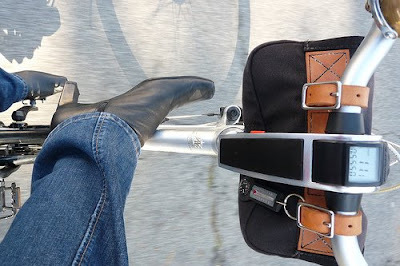 In these jeans, these high heeled boots on my drop tube 30 lb bike. I have had 4 knee surgeries (right knee) and am considered partially paralyzed in both arms. I had surgery on my right wrist in October of last year. So there! Change your life, ride a bike! If the kind of horse you're referring to is a beautiful palomino whizzing gracefully through the streets of SF, then yes, agreed! I saw the post on streetsblog and thought it belonged with us too. Thanks, Adrienne. Very different!! I love my new cycling shoes which got from Performance Bike... Those are very comfortable! !